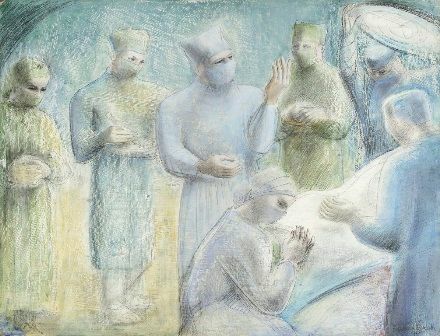 In the late 1940s Barbara Hepworth embarked on a series of studies of the operating theatre at the invitation of her friend, the surgeon Norman Capener. Over a two-year period, (1947-49), Hepworth produced around 80 works within the series. As well as pencil, ink and chalk drawings, many were executed in both pencil and oil paint on board, and as such can be seen as both paintings and drawings. The remarkable artworks demonstrate Hepworth's consummate skill as a draftsperson and the synergy she felt between her work as a sculptor and the surgeon's craft. This exhibition of over 30 drawings comes to Pallant House Gallery as part of a three venue tour following the Hepworth Wakefield. It is a Mascalls Gallery exhibition curated by Nathaniel Hepburn.